It’s the most wonderful time of the year! The music, lights, festivities, and spirit of giving make for a magical atmosphere. One of the things I enjoy most about the holiday season is the giving part! Gift-giving doesn’t have to be about buying the most expensive gift. No way! It’s about showing gratitude for someone in your life. Capture the spirit of the holidays by creating gifts and treats laced with love and your own personal touch. 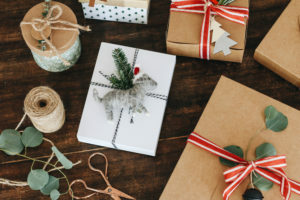 I’m not a fan of shopping malls (thank goodness for online shopping), but I’m head over heels in love with wrapping presents! 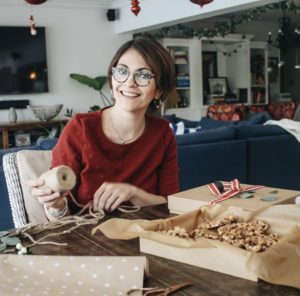 My favorite way to wrap is with craft or solid white paper, twine, a small wood ornament, some sort of natural element (twig, pine or eucalyptus) and a simple gift tag. Or ditch the paper completely and wrap gifts in fabric, burlap bags, or even cellophane bags! Always take the size, shape, and weight of the gift into consideration. 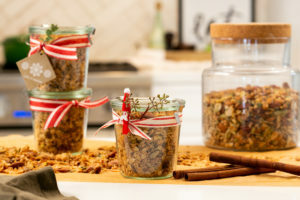 In the spirit of gift giving, I’m including three delicious and easy-to-make treats that you’ll fall in love with! 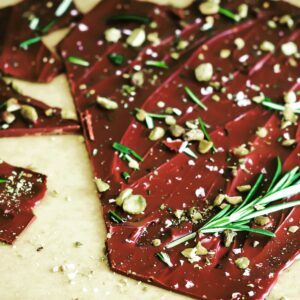 The chocolate bark, granola, and herbed nuts taste as good as they look (if not better) and they’re perfect for gift giving and sure to add holiday cheer! Melt chocolate in a microwave-safe glass bowl. Heat in the microwave for 1 minute, stir and continue to melt in intervals of 30 seconds, stirring well after each time, until most of the chocolate is melted. On a large rimmed baking sheet, toss the mixed nuts with maple syrup, sugar, olive oil, chipotle or harissa powder, 3 tablespoons rosemary, half the sage, salt and pepper. 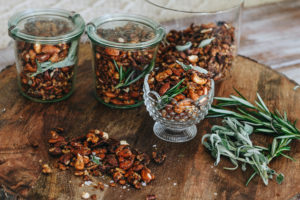 Roast the nuts for 25 – 30 minutes, until crisp but not too brown; stirring twice with a metal spatula or spoon to prevent nuts from clumping together. Remove from the oven and sprinkle with remaining rosemary and sage. Toss well and let cool on the baking sheet. Taste for seasoning. Add more salt if needed, and serve warm or transfer to an airtight container. Store at room temperature. For more fabulous ideas for holiday celebrations, gifting and making the most of gatherings with your loved ones, visit us at The Mad Table website. And be sure to like The Mad Table on Facebook and follow us on Instagram for all the latest news, fabulous recipes and beautiful entertaining tips and ideas.